Postconflict peacebuilding developed into something of a growth industry in the 1990s. The first major operation was deployed to Namibia in 1989, followed by missions to Nicaragua (1989), Angola (1991), Cambodia (1991), El Salvador (1991), Mozambique (1992), Liberia (1993), Rwanda (1993), Bosnia (1995), Croatia (1995), Guatemala (1997), East Timor (1999), Kosovo (1999), and Sierra Leone (1999). In total, fourteen major peacebuilding operations were deployed between 1989 and 1999 to territories that had recently experienced civil conflicts.13 These operations involved a diverse array of international actors performing a wide range of functions – from writing and rewriting national constitutions to drafting criminal laws, organizing and administering elections, tutoring policemen, lawyers, and judges, formulating economic policies, and temporarily taking over the administration of entire territories – all in the hope of establishing the conditions for stable and lasting peace. Some missions, such as the operations in Bosnia and Kosovo, attracted close attention from the international news media, while others labored away in relative obscurity. 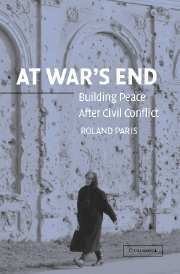 But taken together, these fourteen peacebuilding operations represented the most ambitious and concerted international effort to rehabilitate war-shattered states since the Allied reconstruction of Germany and Japan following World War Ⅱ. Peacebuilding was nothing less than an enormous experiment in social engineering, aimed at creating the domestic conditions for durable peace within countries just emerging from civil wars. What principles and assumptions guided this experiment? Which models or theories of conflict management, if any, did international peacebuilders apply in their efforts to rehabilitate war-shattered states? While the literature on peacebuilding has burgeoned since the end of the Cold War, few writers have scrutinized the assumptions that underpin the design and conduct of these operations.14 Observers have dissected the strengths and weaknesses of many missions, but paid relatively little attention to the conceptual foundations of peacebuilding itself, or the basic premises upon which these operations are based.15 Such questions are important, however, because they allow us to investigate whether the prevailing approach is, or is not, well suited to the task of consolidating peace in war-shattered states, and whether alternative means might be more appropriate. Given the importance of peacebuilding as a means of managing civil violence in the post–Cold War world and the threats that uncontrolled internal conflicts pose to regional and global security and to human welfare, any opportunity to improve the effectiveness of future operations should be vigorously pursued. My thesis is straightforward. Peacebuilding missions in the 1990s were guided by a generally unstated but widely accepted theory of conflict management: the notion that promoting “liberalization” in countries that had recently experienced civil war would help to create the conditions for a stable and lasting peace. In the political realm, liberalization means democratization, or the promotion of periodic and genuine elections, constitutional limitations on the exercise of governmental power, and respect for basic civil liberties, including freedom of speech, assembly, and conscience. In the economic realm, liberalization means marketization, or movement toward a market-oriented economic model, including measures aimed at minimizing government intrusion in the economy, and maximizing the freedom for private investors, producers, and consumers to pursue their respective economic interests. Although the fourteen peacebuilding operations launched between 1989 and 1999 varied in many respects, their most striking similarity is that they all sought to transform war-shattered states into “liberal market democracies” as quickly as possible. Underlying the design and practice of these operations was the hope and expectation that democratization would shift societal conflicts away from the battlefield and into the peaceful arena of electoral politics, thereby replacing the breaking of heads with the counting of heads; and that marketization would promote sustainable economic growth, which would also help to reduce tensions. Peacebuilding, in this sense, was a specific kind of social engineering, based on a particular set of assumptions about how best to establish durable domestic peace. However, this approach turned out to be more problematic than anticipated. If the test of “successful” peacebuilding is simply whether large-scale conflict resumed in the aftermath of a peacebuilding mission, then most of the operations conducted in the 1990s were successful, because in all but three cases (Angola, Rwanda, and Liberia), large-scale hostilities have not resumed. But if we use instead the standard of success articulated by Kofi Annan and Boutros Boutros-Ghali – namely, the establishment of a “sustainable” peace, or a peace that will endure long after the peacebuilders depart from the country – then the picture becomes less favorable.18 As we shall see, international efforts to transform war-shattered states have, in a number of cases, inadvertently exacerbated societal tensions or reproduced conditions that historically fueled violence in these countries. The very strategy that peacebuilders have employed to consolidate peace – political and economic liberalization – seems, paradoxically, to have increased the likelihood of renewed violence in several of these states. Peacebuilders apparently believed that democratization and marketization would foster domestic peace; and, as it happens, there is a large body of empirical scholarship that partially supports this belief. Students of the “liberal peace thesis,” from John Locke to the present day, have argued that liberally constituted states tend to be more peaceful both domestically and in their dealings with other countries, and recent evidence has shown that well-established market democracies are, indeed, less subject to internal violence than other types of states.19 But it also appears that the transition from civil conflict to a well-established market democracy is full of pitfalls: Promoting democratization and marketization has the potential to stimulate higher levels of societal competition at the very moment (immediately following the conflict) when states are least equipped to contain such tensions within peaceful bounds. Peacebuilders in the 1990s seemed to underestimate the destabilizing effects of the liberalization process in the fragile circumstances of countries just emerging from civil wars. Their desire to turn war-torn states into stable market democracies was not the problem; rather, the methods they used to effect this change, including their failure to anticipate and forestall the destabilizing effects of liberalization, proved to be the Achilles’ heel of peacebuilding. Peacebuilding missions in the 1990s reproduced Wilson’s faith in the peace-producing powers of liberalization. This faith proved to be overly optimistic in Central and Eastern Europe after World War Ⅰ, where tensions remained and fighting resumed, and also seems to be an overly optimistic formula for peacebuilding in the post–Cold War era. The purpose of this book, however, is not to reject the Wilsonian peacebuilding strategy in its entirety, but to expose the weaknesses of the naive version of Wilsonianism that informed the missions of the 1990s. Indeed, I shall argue that peacebuilders should preserve the broad goal of converting war-shattered states into liberal market democracies, because well-established liberal market democracies tend to be peaceful in both their domestic affairs and their relations with other states. The challenge, however, is to devise methods of achieving this Wilsonian goal without endangering the very peace that the liberalization process is supposed to consolidate. To this end, I shall propose a new peacebuilding strategy called “Institutionalization Before Liberalization,” which begins from the premise that democratization and marketization are inherently tumultuous transformations that have the potential to undermine a fragile peace. The new strategy would seek to minimize the destabilizing effects of liberalization in several ways. First, peacebuilders should delay the introduction of democratic and market-oriented reforms until a rudimentary network of domestic institutions, capable of managing the strains of liberalization, have been established. Second, once these institutions are in place, peacebuilders should manage the democratization and marketization process as a series of incremental and deliberate steps, rather than immediately unleashing political and economic competition. The strategy contains many other elements, but its core principle is this: What is needed in the immediate postconflict period is not quick elections, democratic ferment, or economic “shock therapy” but a more controlled and gradual approach to liberalization, combined with the immediate building of governmental institutions that can manage these political and economic reforms. Institutionalization Before Liberalization may, at first glance, seem more costly and time-consuming than the “quick and dirty” approach to liberalization that predominated in the 1990s. However, the potentially higher expense and longer duration of such operations must be weighed against the costs, both in human lives and material resources, that would follow a recurrence of large-scale violence. This strategy may also appear to be contrary to the goal of promoting market democracy, because it calls upon peacebuilders to delay the liberalization of political and economic life during the first, fragile period of postwar reconstruction. The objective of this approach, however, is ultimately to achieve more successful transitions to market democracy in countries that are vulnerable to the destabilizing effects of rapid liberalization, and thus to establish a more durable peace. If, as I argue, pervasive civil conflict poses one of the principal threats to human welfare and global security in the post–Cold War era, and the prevailing approach to peacebuilding is flawed, then new policies for more effective peacebuilding are warranted. The book speaks simultaneously to scholars and practitioners of peacebuilding, and to others interested in the challenges of managing civil violence. The central finding – that implementing liberalization too quickly and in the absence of effective institutions can counteract efforts to consolidate peace – has immediate implications for policymakers in national governments and international organizations who have the primary responsibility for designing peacebuilding operations. Yet this is not simply a work of policy analysis or policy prescription, for it raises questions that scholars of international relations and comparative politics have yet to explore in depth. In what ways, for example, might the transition to market democracy imperil domestic peace, particularly in the immediate aftermath of civil conflict? The liberalization process itself, I shall argue, can give rise to several different “pathologies” that may occur in any state undergoing such a transition. Peacebuilding host states are particularly susceptible to these problems because of the distinctive characteristics of societies that have recently experienced internecine violence – characteristics that will be described in Chapter 9 – and, as we shall see, the Institutionalization Before Liberalization strategy is specifically designed to anticipate and avert these pathologies. This volume also contributes to ongoing debates over the liberal peace thesis. As noted, supporters of this thesis have long argued that liberal states tend to be more peaceful than other kinds of states. Unlike their Enlightenment-era predecessors, however, contemporary contributors to this literature have tended to “bracket” or ignore the question of how to build market democracies in conditions where governmental institutions do not exist or are only fragmentary.23 As a result, we have learned a great deal from this literature about the benefits of market democracy once it is established, but very little about the war-proneness of states undergoing this transition, particularly in the immediate aftermath of internal violence. This book uses the record of peacebuilding to investigate this little-explored branch of the liberal peace thesis: the relationship between liberalization, institution building, and peace in countries that are just emerging from civil conflict. In addition to addressing the specific concerns of both practitioners and theorists of conflict management, this book seeks to break down the artificial separation between those who study “theory” and those who focus on the “real world” problems of policy analysis and implementation. Too often, the practitioners of peacebuilding dismiss academic theorizing as overly abstract and detached from the practical challenges of running field operations. At the same time, many theorists of international relations and comparative politics make too little effort to translate their findings into recommendations for policymakers. This volume, by contrast, aims to set out and scrutinize the theoretical foundations of peacebuilding, and in so doing, to diagnose problems in the design and practice of these operations that might otherwise go undetected. At War’s End is divided into three parts. Part Ⅰ (“Foundations”) examines the political and ideological origins of peacebuilding, and investigates the assumptions that underpin these operations. Chapter 1 traces the history of peacebuilding and the resurgence of Wilsonian approaches to conflict management at the end of the Cold War. Chapter 2 examines historical and contemporary scholarship on the liberal peace thesis, arguing that many important questions remain unanswered, including the question of whether marketization and democratization offer a reliable remedy for civil conflict. Part Ⅱ (“The Peacebuilding Record”) evaluates the effects of internationally sponsored liberalization efforts in eleven peacebuilding missions deployed between 1989 and 1998. Chapter 3 explains the methodology and scope of the case studies. Chapters 4 through 8 examine the effects of democratization and marketization in Namibia, Nicaragua, Angola, Cambodia, El Salvador, Mozambique, Liberia, Rwanda, Bosnia, Croatia, and Guatemala. Three post-1998 operations – in Kosovo, East Timor, and Sierra Leone – are discussed later in the book and in more provisional terms, because of their relative recentness. Part Ⅲ (“Problems and Solutions”) describes the shortcomings of rapid liberalization as a peacebuilding strategy during the 1990s and recommends a new approach for future operations. Chapter 9 summarizes the findings of the case studies and explains why liberalization has sometimes had destabilizing effects on peacebuilding host states. Chapter 10 elaborates the “Institutionalization Before Liberalization” strategy and responds to several possible critiques of this approach. Chapter 11 examines the record of missions launched after 1998, and explores the logistical and political challenges to reforming peacebuilding in the future.